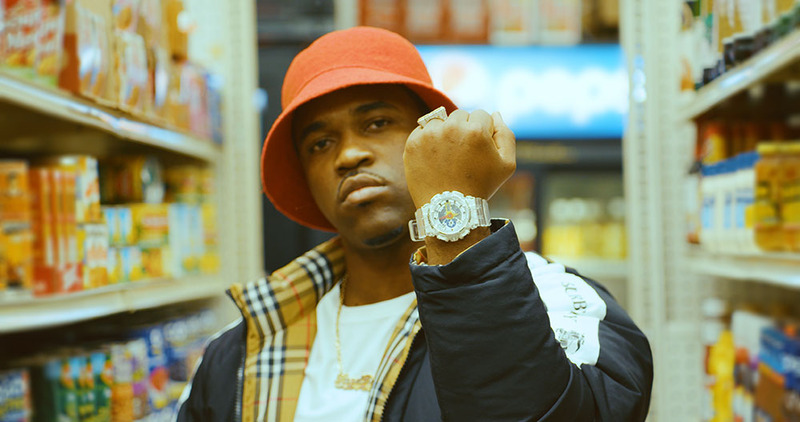 DOVER, NEW JERSEY, Nov. 29, 2018 - Today, Casio G-SHOCK announces the debut of an all new timepiece (GA110FRG-7A) created in collaboration with chart-topping rapper, A$AP Ferg. The watch, which is the first between G-SHOCK and the artist, is based on G-SHOCK’s original GA110 model. Featuring a clear resin band and bezel with blue, red and yellow accents on the dial face, the watch also features A$AP Ferg’s signature on the band loop and case back. The watch comes in a custom limited-edition packaging. A life-long G-SHOCK fan, A$AP Ferg’s partnership with the brand follows his performance at the G-SHOCK 35th Anniversary event last year in New York City. “G-SHOCK is legendary and I’m so excited to introduce this watch to the world," said A$AP Ferg. “I really enjoyed the collaborative design process and I think my fans are going to love the result." Coming off the success of his Still Striving release and its double platinum-selling single, “Plain Jane," A$AP Ferg embodies G-SHOCK’s core ethos of “Absolute Toughness". “When I sat down to design my G-SHOCK watch, I kept thinking about how watches work," said A$AP Ferg in regards to the inspiration behind the timepiece. “It brought me back to a memory I didn’t realize I had: my Aunt Kim’s bedroom telephone. It was a transparent phone, where you can see all the inner workings and when it rang it lit up inside. That design was so beautiful to me. It had a bit of primary colors and touches of neon throughout. I wanted my watch to look the same way. Transparent with neon hits; clean and beautiful." A video was created to showcase the new timepiece. Take a look: http://bit.ly/GSHOCKxASAPFerg. Featuring an expanded case size and large anti-skid buttons for easier accessibility, the GA110FRG-7A also boasts premium features such as a speed indicator and mute function. The GA110FRG-7A will retail at $150 and will launch exclusively at Dover Street Market New York and Los Angeles on Friday, November 30th. Additionally, there will be a pop-up signing with A$AP Ferg at the Dover Street Market New York City location on the evening of November 30th. The timepiece will then be available for purchase beginning in December 1, 2018 at G-SHOCK authorized retailers including Macy’s, G-SHOCK Soho Store, and gshock.com. A$AP Ferg is an American rapper from New York City's Harlem neighborhood, who launched his debut album "Trap Lord" in 2013 and his follow up album "Always Strive and Prosper" in 2016 which bridges the gap between Trap Lord and his mixtape of Ferg Forever as far as his growth and maturity as an artist. Ferg's latest release is a mixtape called "Still Striving," which launched in August 2017. In 2018, his single “Plain Jane" has gone on to reach double platinum and he completed a wildly successful North American “Mad Man" tour. In addition to his solo career, A$AP Ferg is part of the hip hop collective A$AP Mob. Although rapping is one of his main passions, he is a successful business owner, entrepreneur and painter.